Slidell Little Theatre is a true community theater with a mission to “engage, educate and involve members of the community.” So, in addition to its family-friendly fare, it also supports a Senior Actors Theatre, which has produced live radio shows; Theatre for Young Audiences with plays suitable for children, such as the recent “Cinderella Battistrella,” a Cajun Spin on a Classic Tale; and YATS, Young Actors Theatre, a summer acting workshop for kids. Acting, costuming, lighting, dancing and project management are all done by volunteers and everyone is welcome. Heck, the directors even post audition tips on the website for newbies. So, if you have been considering exercising your thespian skills, Slidell may be the nurturing environment to try. In fact, auditions for the wacky, musical comedy Young Frankenstein written by Mel Brooks will be held at 6:00 p.m. – 9:00 p.m., Monday, March 6. Put on your dancing shoes! 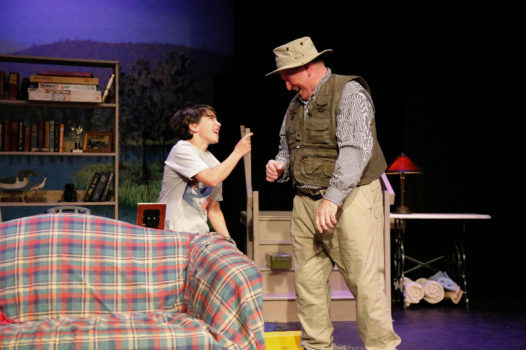 On the main stage, weekends through March 19, On Golden Pond, a heartwarming intergenerational play, features Kenneth Flaherty and Suzanne Stymiest as Norman and Ethel Thayer, an elderly couple who spend their summers at a lake house on Golden Pond. When their estranged daughter makes a surprise visit with a new boyfriend and his teenage son, the couple is challenged by family dynamics. Director David Jacobs says Flaherty has mastered the role and literally “become” Norman. The play, which ran on Broadway, winning a Drama Desk Award, was adapted to film, starring Henry Fonda and Katharine Hepburn as the doddering couple and Jane Fonda as their rebellious daughter. Henry Fonda won a Golden Globe for best actor and Hepburn won the Academy Award for best actress. But Jacobs cautions attendees that the film and play are quite different. Slidell Little Theatre has more than 700 members and entertains approximately 10,000 adults and children every season.